If you want to keep your mattress from bacteria, mould, allergens and dirt, you should hire a professional help in the cleaning. 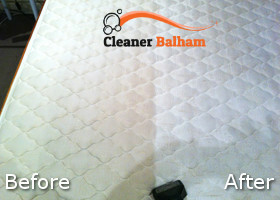 Our company is a high class provider of mattress cleaning throughout Balham SW12. You need the perfect care for your mattress because it is an expensive investment and you need to sleep comfortably in order to be in good health. Our professional cleaners will clean and refresh your mattress and it will look like a new one. In our hands we hold the latest equipment for cleaning mattresses. You will definitely not be disappointed, but pleased and satisfied with the provided service. The best period to clean your mattresses is between six months. If you want a healthy and clean environment in your home, you should better call us right away. We will quickly clean your mattress and leave no stain on it. You will not regret it. All you need to do is pick up the phone and arrange an appointment at convenient for you time. We do not extra charge for evenings, weekends or holidays. Our professional cleaners will come to your home right on the arranged time for a proper mattress cleaning. The service is around an hour. Firstly, we will examine the material of the mattress and the damage. We will pre-treated it with natural products. Then we will turn on the steamer which works with water only. The high temperature will leave no stain, bacteria or dirt on it. If there is more stubborn stains, our team will clean it again, and will apply stain protector to make the future cleaning even easier. The drying process is about 3-4 hours, so you need to wait a little before you go to sleep. Enjoy your perfectly clean and fresh mattress. 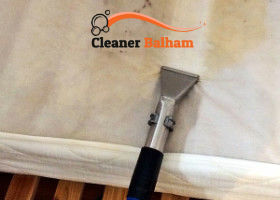 If you are looking for a mattress cleaning service in Balham SW12, we are your guys. Call us or email us.